The perfect combination of sport and luxury, serviced at the perfect combination of skill and knowledge, Deutsche Technik. Porsche is one of the most special vehicle manufacturers in the world. Although Porsche is most famous for the legendary Porsche 911, today Porsche boasts an entire sport vehicle line up including two mid-engine sports cars (718 Boxster and 718 Cayman), a sedan (Panamera), and two SUV’s (Macan and Cayenne). 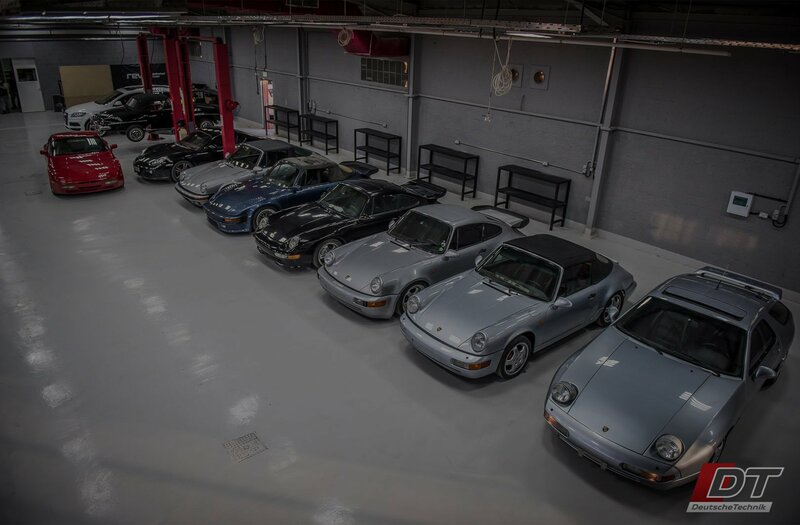 One of the most astonishing things about the brand is how the Porsche DNA runs strong throughout the entire lineup. There is a special characteristic feature of Porsche performance that can be felt in modern day Porsche 911s that dates all the way back to the Porsche 356 of the late 40s. Truly a remarkable feat that speaks to the strength of Porsche’s identity and vision for what an automobile should be. Deutsche Technik has a wealth of experience with Porsches from the air cooled original Porsche 911, it’s turbo variant the 930, the 964 and the 993 all the way up to the water cooled 996, 997 and 991. Not to mention of course a plethora of Boxsters, Caymans, 718s, Cayennes, Macans, and of course the Panamera. For such a special manufacturer, you should put them in the hands of a special workshop. Deutsche Technik is owned and operated by petrol heads who love nothing more than a well sorted Porsche. Our technicians know these cars inside and out, and we have all the necessary equipment to deliver a targeted approach to troubleshooting and offer lasting repairs. REVO is a UK based tuning company specializing in VW, Audi, Ford, Porsche, Seat and Skoda tunes. REVO also offer a host of world-class hardware upgrades such as intake kits, intercoolers, turbochargers, brake discs, big brake kits, engine and gearbox mounts, turbo muffler deletes, high pressure fuel pumps, downpipes, intercooler charge pipe upgrade kits, wheels, and much more. More power and speed, and still maintain the factory warranty! What more could you ask for? RaceChip is an industry leading German chip-tuning company that engineers and manufactures all of their products in Germany. They offer chip-tuning kits for all the major manufacturers, and throttle response enhancing modules for all vehicles. Up to 30% more power can be easily extracted from your vehicle, which is sometimes over 100 bhp, safely and reliably. That’s right! Mention coupon code DT10LAB to any service advisor at Deutsche Technik and receive 10% off labor charges! One time use per customer, cannot be stacked with other discounts. That’s right! Mention coupon code DT20AC to any service advisor at Deutsche Technik and receive 20% off an A/C ReGas. One time use per customer, cannot be stacked with other discounts. That’s right! Mention coupon code DT10BODY to any service advisor at Deutsche Technik and receive 10% off an Body Work. One time use per customer, cannot be stacked with other discounts. Cannot be applied to works that have already been quoted and/or approved.